When one hears the word “concrete”, what typically comes to mind is drab, cold, grey surfaces. 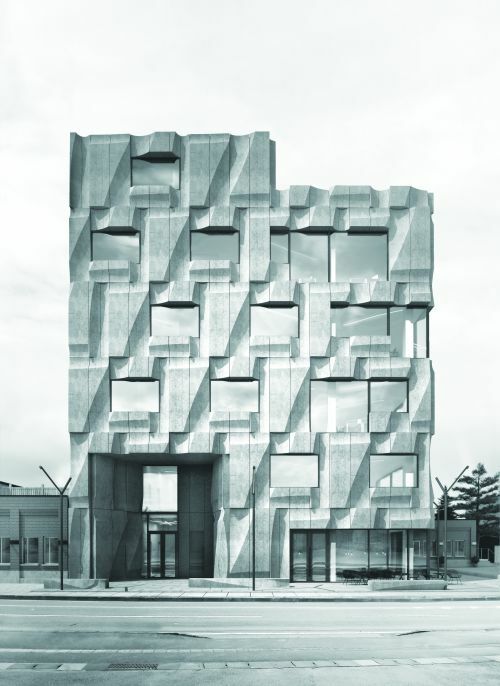 But thanks to advances in technology, the way architects and designers look at concrete is changing as it is becoming a building element that can be creatively designed by adding colour, texture and patterns, to fit any style. Mimicking nature and reproducing the appearance of natural materials such as woodgrain textures or rock patterns, or even brick outlines and other creative designs, stamped concrete provides hundreds of possibilities for decorative concrete surfaces. While typically associated with horizontal surfaces, thanks to new technology it is now possible to create decorative art effects on both walls and other vertical surfaces, both interior and exterior. A huge new trend is very lightly etched concrete surfaces with no joints, creating seamless surfaces. Normally done through sandblasting or by using acid wash, new extra-light surface retarders are now used to obtain a light surface etch of approximately 0,25mm thick. This dry-shake powder can be incorporated into fresh cast-in-place concrete and using new-generation stencils instead of stamps, various designs can be created with different colours. Though not a new development, shaped concrete is a good way to create interesting vertical surfaces. Using formwork or moulds to cast concrete panels, it is possible to create almost any kind of shape or design that one can imagine with concrete from gently flowing structures, curves, edges and more. 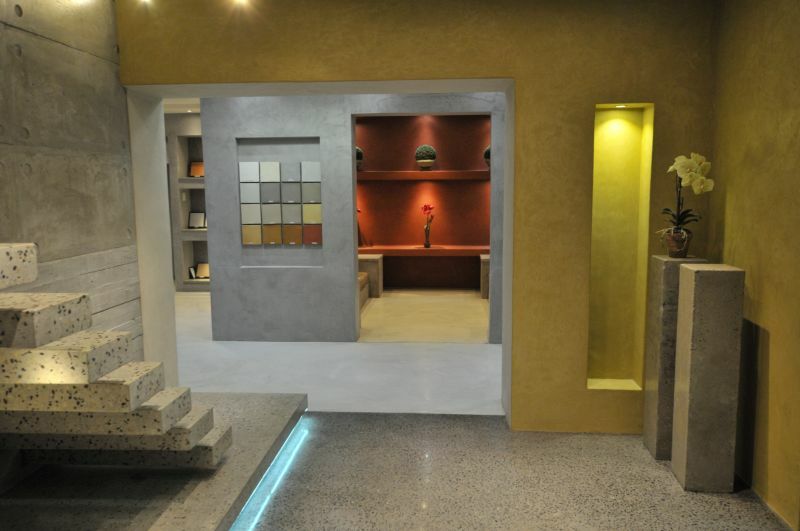 With a wide range of colour pigments available, both ready-mix concrete and dry-cast products can be coloured to different intensities, shades and brightness. One can choose to only colour the surface or to specify integral colouring, which infuses the concrete throughout so that even when abrasion occurs, the colour won’t wear away. It is important, however, to use the same cement from the same plant in order to get a consistent colour, since Portland cement can vary from light to dark grey. The cement content, aggregate colour and texture, as well as the total water content, can also influence the colour of pigmented concrete. It is also possible to colour or embellish existing concrete or to restore faded colours using concrete dyes, stains or with an overlay of pigmented concrete. 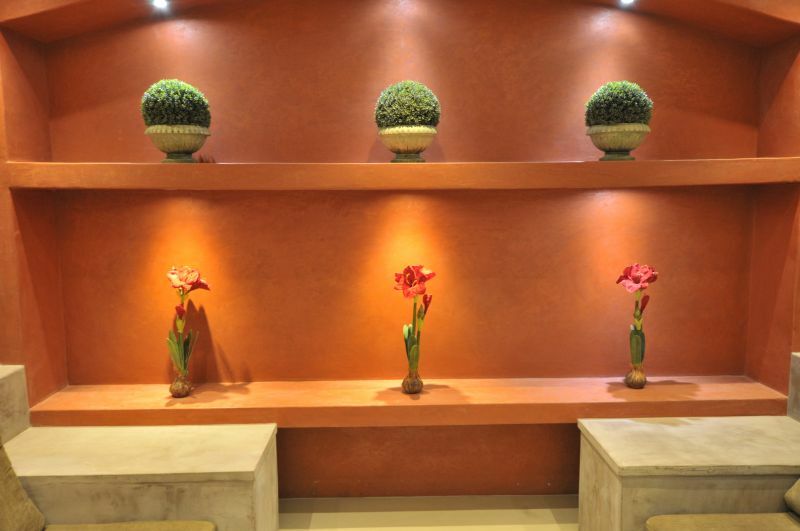 A mustard-coloured wall covered in Stucco Italiano wall plaster. Unlike using solid colour pigments, metallic coatings create unique sparkling textures and effects, good for industrial interiors, with no two surfaces looking exactly the same. Metallic epoxy coatings are usually applied with a coating knife and smoothed over the vertical surface or smeared using creative blending techniques. One can use more than one metallic colour, with or without an accent background colour, and can even create textured surfaces. 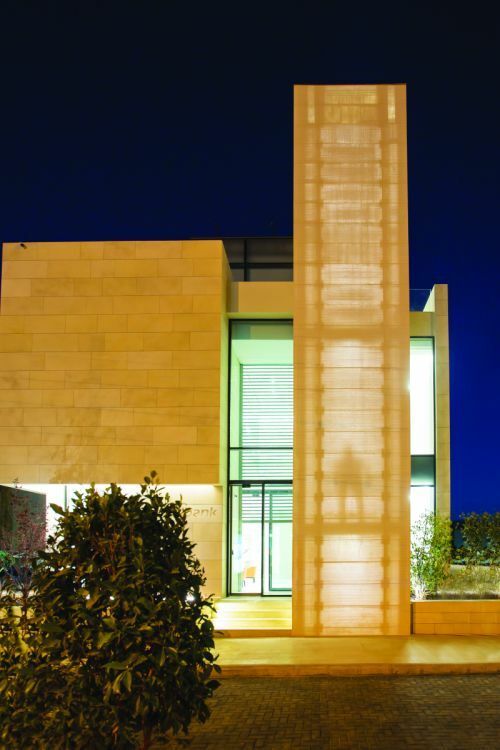 Also known as “glow-in-the-dark” concrete, luminescent particles are incorporated into the concrete surface, which makes the wall glow brightly in the dark. During the day, the surface looks like ordinary concrete while the aggregates absorb light so that at night, it radiates for hours. Luminescent concrete is available in various colours and contains a range of particle sizes to suit different application requirements. Not to be confused with luminescent concrete, translucent or light-transmitting concrete contains embedded optical fibres that transmit incident light through the material. When it is not backlit, it looks like light concrete or natural stone. 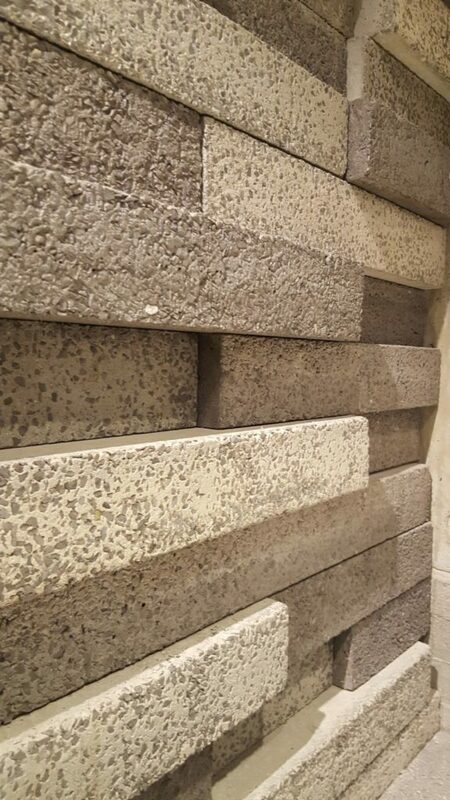 When looking to spruce up existing concrete walls, there is a wide range of plasters available to create a decorative finish. 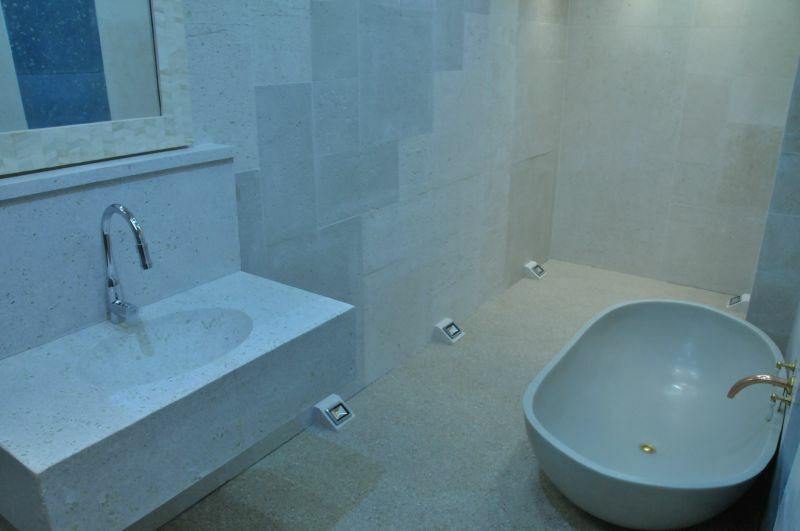 Options include brush on plaster, Stucco Italiano wall plaster, Tadelakt plaster and micro-engineered overlay (MEO) plaster. All of these can be applied to walls and are available in various colours. 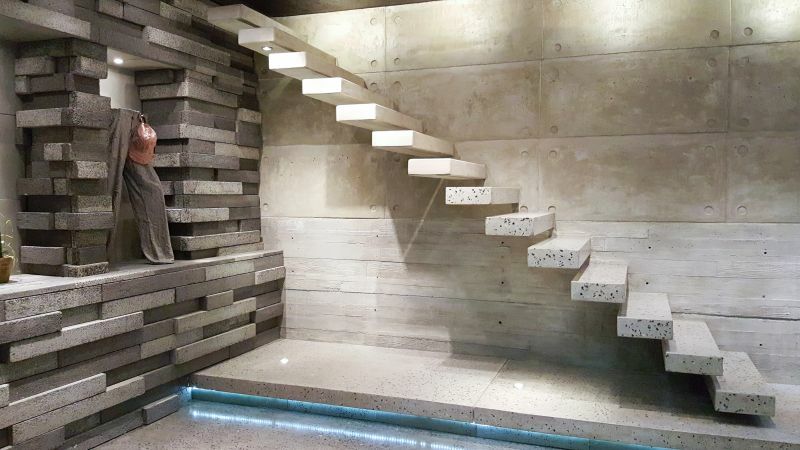 As a good alternative for seamless concrete panel wall designs, exposed aggregate concrete modifies the normal appearance of concrete and creates textured surfaces with a warm, natural look. 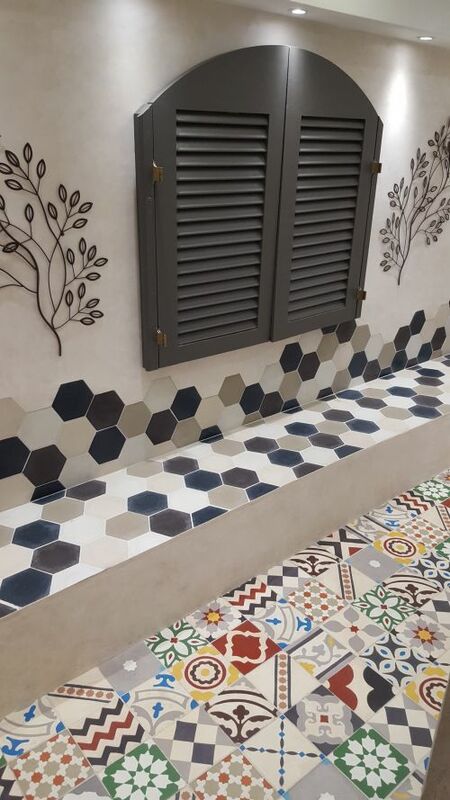 The outcome can be varied by using different colours and sizes of aggregates, different colours of cement paste and by adjusting the etch depth of the surface retarder. When looking to restore or change existing concrete surfaces, there are many repair solutions available that can be sprayed on or applied in a thin layer. Textured or coloured overlays, for example, can completely change the look of a space without requiring major construction, while sprayed cementitious polymers are good for restoring peeling concrete and film-forming finishes protect aesthetic concretes. Another option, waxed concrete, is a cementitious plaster which can be trowelled onto existing walls in a layer of only about 1-2mm thick. Each application will have an original look, depending on the applicator’s hand, tools and viscosities of the product. Thanks to all these advances and the myriad of options it gives architects and designers to enhance the artistic properties of a building, decorative concrete is growing in popularity. But, although the focus for using decorative concrete is on the aesthetic, unique and versatile properties, it still needs to be strong, durable and accessible. Therefore, with more and more products coming to market, it is important to specify good concrete, products fit for each project, and to get the necessary advice and know-how to ensure durable, long-lasting applications that live up to clients’ expectations. Full thanks and acknowledgement are given to Chryso, World of Decorative Concrete and LUCEM for the information contained in this article.